It’s Halloween week and Financial Literacy Month is just around the corner, right after the ghosts and goblins visit. Just in time too, because it turns out it’s not just your imagination: communications from CRA are somewhat ghoulish. The CBC reported on the story this morning, citing several other reports, including a 2012-2013 study from the Walker Consulting Group which found that taxpayers they interviewed considered the letters and notices from CRA to be so full of unintelligible messaging that they did not understand what, or how much, CRA wanted from them. It’s a reality the new Financial Literacy leader may wish to weigh in on, as Canada’s national strategy on Financial Literacy is developed. The cost of all the gibberish is an expensive follow up system with taxpayers who contact the agency to find out what they are being asked for. That’s problematic, too. With recent staff cuts, those files can sit unanswered for months. Meanwhile, taxpayers will continue to see rising monthly compounding interest charges on overdue balances — real or requiring adjustment — making the eventual reconciliation of the original problem even more incomprehensible. CRA’s answer to all of this, for now, includes a plan to consult businesses this fall for feedback and then to allow individuals to receive online correspondence starting in February of the new year. And that’s perhaps where the connection to Halloween comes in: regardless of how invisible or unintelligible the correspondence from CRA may be, the onus is still on the taxpayer to comply with the CRA or face the financial consequences. The good news? You may request a cancellation of interest or penalties using Form RC4288, and other Taxpayer Relief, if required. It’s Your Money. Your Life. Don’t get spooked by CRA messaging. If you are having trouble deciphering either hard copy or soft, contact a DFA-Tax Services Specialist immediately to get to the bottom of it. 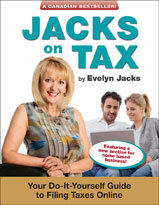 Evelyn Jacks is President of Knowledge Bureau and author of 51 books on tax and personal wealth management. Meet Evelyn on the Year-End and Business Succession Planning Bootcamp tour this November. Follow Evelyn on Twitter at @EvelynJacks. Tax and financial advisors should make an effort to review their clients adjusted cost base records as part of the annual Year-End Tax Planning routines now ’til the end of the year, especially if the family owns a taxable cottage property. Ancient tax law is important in these cases. Dating back 20 years to February 22, 1994, digging out the Capital Gains Election form could save tens of thousands of dollars on an actual or deemed disposition, which can happen at death or immigration, for example. The $100,000 capital gains election available was eliminated on February 22, 1994, but taxpayers were able to elect to increase the adjusted cost base of assets by the amount of accumulated appreciation (up to $100,000) and the form T664 was used to do this. If assets owned in 1994 are still on hand, look for that form now or call CRA to get copies of the information to ensure that cottage transitions record those values as the adjusted cost base. Otherwise, the danger is the lower, original cost base values will be used, and this can cost the family thousands. John and Susan, for example, inherited their family cottage from Susan’s mom and dad in 1985 when it was valued at $25,000. After adding a new deck and bathroom and revaluing the cottage on February 22, 1994, they found it was worth $95,000. They were able to elect to increase the cost base by $70,000 by filing form T664 on February 22, 1994. Today the cottage is valued at $395,000. If they use the original cost base, their capital gain on disposition will be $370,000 and half of this ($185,000) will be added to Susan’s income on disposition, assuming this property is not their principal residence. Assuming a marginal tax rate of approximately 47%, the taxes owing would be approximately $87,000. However, if the elected value is used, the capital gain would be $300,000; half of this ($150,000) would be added to income and the approximate taxes payable would be $70,000. By using the elected value, the family saves $17,000 in taxes. It’s Your Money. Your Life. Seek the services of a DFA-Tax Services Specialist and an MFA-Retirement Income Specialist in making plans to reduce taxes this year end. These specialists can alert you to important and little known tax advantages that will add significantly to your family’s Real Wealth. Tax planning is about what you keep to live your happy life with. It’s too bad so many people miss out by failing to think about year end tax planning in the family. Understanding your lifetime tax obligation is an important motivator because it will help you understand the magnitude of tax savings possible. Consider this reality check: Find the amount of taxes you paid last year on Line 435 of your tax return. Now multiply that figure by an average working lifetime of 40 years. It’s probably a big number. Are you living with a working spouse? Double the figure if your incomes are relatively equal from similar sources. Four adults in a family in similar income situations will double this amount again. The conclusion is not difficult: income tax, together with all the other taxes we pay on consumption, property taxes, sin taxes, and so on is expensive. For many families, the income taxes they pay year over year is their single greatest lifetime expense. However, income taxes are the only type of taxes you are required to pay in which you have the option to arrange your affairs—within the framework of the law—to pay the least amount possible. You need only pay the correct amount, not more, and using legal and available tax planning techniques significantly reduces that number. That makes the final quarter of the year—October to December—a very good time to review what can be done to make sure your 2014 tax liability is as low as it can be in your family. If you are a tax or financial planning professional, this is a critical time to see your clients, for those purposes. Start with some tax literacy. My rule on this has always been simple: there is no such thing as a stupid tax question, especially at year end. For example, most people don’t understand that different income sources are taxed in different ways. Each type of asset and / or investment has its own unique tax attributes—when invested—as income and value grows and / or on disposition. To build wealth efficiently we must focus on those assets or investments that have the lowest tax cost at the time of investment, during growth and at withdrawal or transition to the next generation. In addition, in many cases, paying investment costs like interest or fees are a necessary component of the wealth building process which requires management. The lower the fees and costs, the easier it is for money managers and lenders to add long term value to family wealth. That’s important, too, because certain other wealth eroders are uncontrollable: the cost of inflation, for example, or unexpected risks from currency fluctuations or political change. It’s Your Money. Your Life. To more rapidly acquire, grow, protect, and transition sustainable family wealth, advisors and clients should consider a proper order of investing. This year end, consider what should come first: the RRSP or the TFSA, the RESP or the RDSP, interest or dividend-producing investments. If you are unclear about what these acronyms mean and what the attributes of these common investments are, consult with a Tax Services Specialist before year end. Be sure to cover year end donation planning and how speeding up the generation of tax losses in your non-registered accounts, medical costs or business asset acquisitions can help you reduce personal taxes. Income splitting and higher limits to TFSAs could make a big difference in Real Wealth Management™ for Canadians families, reducing tax on income both today and in the future when retirement income is drawn completely tax free. It will all depend on how the final legislation is written and whether the government is elected to implement the plan. But because this is an election issue, it’s important that the significance of the potential double gift – income splitting and new TFSA limits – is not lost in the rhetoric. Two parent families with children under 18 had average market income of $106,100. An economic family of two people or more earned an average of $84,400. Lone parent families earned an average of $39,100. These figures put the size of actual market income – total income of the household minus government transfers – into perspective, so we can better answer the key question: Would family income splitting help average families with children? Those who pay more tax save more; the higher the level of income the higher the tax savings, but provincial taxes will cause these results to vary. The more disparity there is between spouses’ incomes, the greater the tax savings. The biggest savings occur when one spouse earns all of the income for the family. The greatest savings as a percentage of taxes otherwise payable occurs when family income is about $90,000 and only one spouse earns the income. The tax savings can then be re-invested into a TFSA for retirement savings, or any other purpose. To maximize the double gift, it’s important is to clearly define family and retirement goals. If we assume the average Canadian couple needs to save somewhere between $250,000 and $750,000 for retirement, depending on their intended lifestyles and available income sources, these potential new tax incentives can help you reach lifestyle goals faster. Consider that under current rules, $5500 invested each year in a TFSA for the spouse who did not work over the 25 year child rearing period, age 35 to 60, will create a free retirement fund of $275,624. But, if the TFSA limits were doubled, and family is firm about putting tax savings there, tax free retirement income would double too. In addition, family income splitting will simplify the tax system, and that will make it fairer. Together with the tax savings and the TFSA changes, the proposed changes on the horizon could be a really good thing. Hopefully that message will not be lost in the politics. It’s Your Money. Your Life. Putting more after-tax dollars into the hands of young Canadian families provides more choice in securing financial futures, while enabling the gift of more time with little ones at home. Would a tax windfall from family income splitting change the economic decisions young families could make? It’s very possible. An MFA–Retirement Income Specialist is trained to help a family budget for future saving and find new money through the tax system to accomplish those goals. Statistics Canada, CANSIM, Table 202-0202 and Catalogue no. 75-202-X, last modified 2013-06-27. Average investment return of 5% has been used. Birth, marriage, death, separation or divorce, university entrance, sale of business, unemployment, illness, career change, self-employment, inheritances, even certain birthdays — all of these life events can have tax consequences. Yet many taxpayers miss significant tax saving opportunities because they don’t keep their advisors informed about personal change. Whenever possible, taxpayers and their advisors should get together before personal milestones occur to discuss their tax consequences. Become familiar with the events that can influence your taxes. Embrace a process of tax-effective, life-goal planning before retirement, disability or death. You could save hundreds, if not thousands, of dollars if you think tax first, as you and your family approach significant milestones in your lives. For this reason, it is important to work with a professional who is there for you all year long. Birth to Age 6: Universal Child Care Benefits will be received regardless of income and Canada Child Tax Benefits may be available to the family, depending on income levels. In addition, working parents will want to know more about claiming child care expenses as a deduction using Form T778. Savings for minor children involve some important tax rules. Be sure to open a bank account for your child and deposit the Universal Child Care Benefit, the Canada Child Tax Benefit, and any gifts from non-resident grandparents — each of these are free from the “Attribution Rules”, which require that income earned on funds transferred or gifted by adults must be reported by the adult. Another exception to this rule is a gift of money invested in capital-gains producing assets. Resulting gains are taxed in the hands of the minor child. New parents may also wish to open RESP savings accounts to earn CESGs (Canada Education Savings Grants) and possibly CLBs (Canada Learning Bonds). If the child is disabled, a disability tax credit may be claimable, and it’s possible the RDSP – a Registered Disability Savings Plan – is a great option for those families, too. These are new and confusing financial opportunities for most families. They require some study and/or consultation with an informed tax and financial advisor who can help families make great decisions about their family’s financial future. Knowledge Bureau has also published three excellent financial books for families that can help: Financial Fotographs, The Smart, Savvy Young Consumer and The One Financial Habit that Could Change Your Life. It’s Your Money. Your Life. Be sure to think about “lifecycles” in maximizing available family tax preferences, especially at year end. Then take the time to teach your children about tax and financial literacy. . .so include them in the account opening activities and the early principles of wealth management.